Fonterra's delivered some expected good news and some unexpected not very good at all news with its latest update. Oh, and there will be no interim dividend. In response to recent strong global dairy prices the co-operative giant has raised its forecast farmgate milk price to a range of $6.30 to $6.60 per kilogram of milk solids from the previous $6 to $6.30 range. But this predictable good news has been more than balanced out by Fonterra slashing its earnings forecast. It's now saying its earnings will be in a range of just 15c to 25c a share, down from the previous pre-Christmas forecast of 25c to 35c. So, if you take the bottom point of that pick, arguably the forecast has been more than halved. The company says it won't be paying an interim dividend. And Fonterra's now reduced its production forecast for the year. With the very wet start to the season, production was running well ahead of the previous year, but the recent very dry spell has cut this. The co-operative's milk collections forecast has now been trimmed from 1,550 million kgMS to 1,530 million kgMS. This would still be up 2% on last year. Chief executive Miles Hurrell says the underlying performance of Fonterra's business is not where it needs to be. "The main pressure points on our earnings are the three we highlighted in our Q1 business update – that’s challenges in our Australian Ingredients and our Foodservice businesses in wider Asia. We are making inroads in addressing them but they will not be solved overnight." Chairman John Monaghan says the improved milk price forecast reflects the increases in global milk prices over the last quarter. “Since our last milk price update in December, global demand has strengthened. This is driven predominantly by stronger demand from Asia, including Greater China. The European Union’s (EU) intervention stocks of Skim Milk Powder (SMP) have also now cleared for the season and, as a result, we expect demand for SMP to be strong. “Global supply remains above last season’s levels, but growth has slowed due to challenging weather conditions in some of the world’s largest milk producing regions – in particular, Australia’s milk production is forecast to be down 5-7% on last season and the EU’s growth has slowed and is now forecast to be less than 1% up on last year. “Here in New Zealand, due to hot, dry weather since the start of the year, we’ve revised our Co-op’s forecast milk collections down from 1,550 million kgMS to 1,530 million kgMS. This is up 2% on last year. “We’ve seen the positive impact of this supply-demand picture on a couple of fronts – the number of bidders and, more importantly, prices for the reference products that make up our milk price have increased over the last six GDT events. The DIRA milk price and the advance rate paid to farmers have been set off a milk price of $6.45 per kgMS. 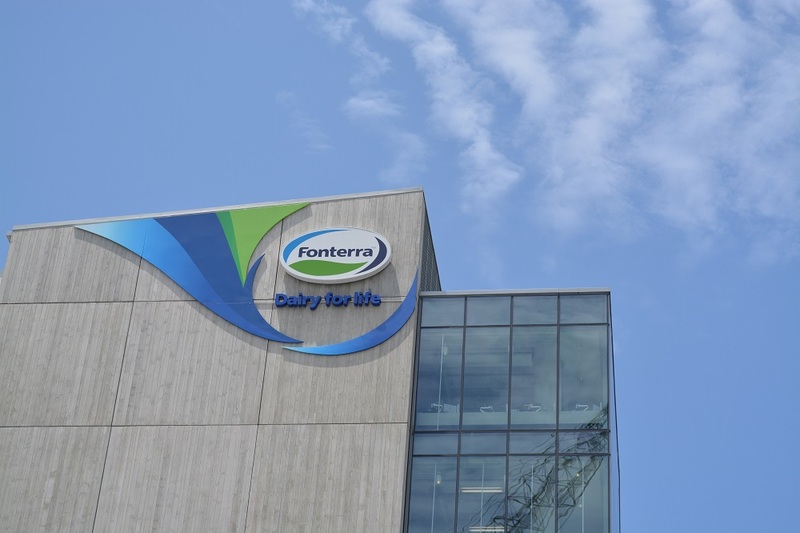 Fonterra is also advising its farmers and unit holders that its forecast earnings range has been reduced to 15-25 cents per share and that it will not be paying an interim dividend. A decision on any full year dividend can only be made at the end of the financial year, and will depend on the Co-op’s full year earnings and balance sheet position. Mr Monaghan says that, while the milk price is strong, the Co-op’s earnings performance is not satisfactory and the Co-op needs to deliver farmers and unit holders a respectable return on their investment. The Board is making solid progress with a full review of the strategy which includes a review of the dividend policy. CEO Miles Hurrell says the underlying performance of the business is not where it needs to be. “The main pressure points on our earnings are the three we highlighted in our Q1 business update – that’s challenges in our Australian Ingredients and our Foodservice businesses in wider Asia. We are making inroads in addressing them but they will not be solved overnight. “Since our Q1 business update, we have also felt the impact of difficult trading conditions in Latin America, mainly due to geopolitical situations in some countries. In addition, the increase in milk price, which is the primary cost input into our non-milk price products, has put pressure on the margins for those products, and they significantly contribute to our earnings. “We remain committed to financial discipline. We are making good progress on our portfolio review and asset divestments in order to reduce our debt by $800 million this financial year. We are also on track to meet our targets for capital expenditure and operating expenses,” says Mr Hurrell. See here for the full dairy industry payout history. I'd be interested to see the next quarters results given the fallout from Huawei since then. When Fonterras financial results came out last year there were 6,000 employees earning more than $100,000 p.a. Do you think the number is higher or lower now? I'd going with higher. I don't think 100k is that high a salary, especially if you have children and live in AKL. It depends on what forex values they use as they convert offshore employees earnings in to NZ dollars.